• Stands up to cleats and nature's elements • Rolls up for easy storage • Great for branding • Super tough, very durable 800.790.7611 Visit Us At BigSigns.com Call Us Textured Ceramic Heavy-Duty Coin PowerDeck On-Deck Circles™ are a unique product for generating sponsorship revenue, or branding your team, on your field. 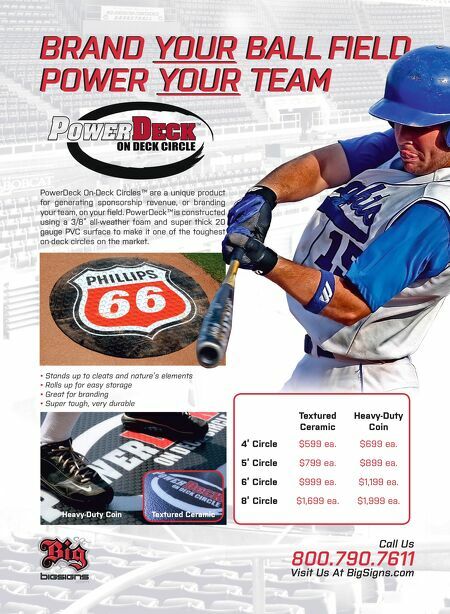 PowerDeck™ is constructed using a 3/8" all-weather foam and super thick 20 gauge PVC surface to make it one of the toughest on-deck circles on the market. BRAND YOUR BALL FIELD POWER YOUR TEAM BRAND YOUR BALL FIELD POWER YOUR TEAM Textured Ceramic Heavy-Duty Coin 4' Circle $599 ea. $699 ea. 5' Circle $799 ea. $899 ea. 6' Circle $999 ea. $1,199 ea. 8' Circle $1,699 ea. $1,999 ea.